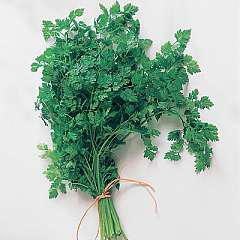 Chervil (Latin Name: Anthriscus Cerefolium) is a winter hardy annual herb, and its leaves can be used fresh all-year-round. Chervil is very quick growing. It has a rich savoury taste which resembles caraway. Chervil prefers light, well drained soil. It does not like damp, humid conditions, so should not be overwatered. Chervil will grow in sun or part shade. Thin the seedlings to 5cm (2 in) apart. (if growing for leaves), or 23cm (9 in)apart if for seed. Remove the flowers from most of the plants before they open and keep watered. The leaves can be chopped and used in salads, stews, herb butter, dressings, etc., or used as a garnish in the same way as parsley. Blends well with fish and meat. Chervil is included in the How to Grow Culinary Herbs eBook written by TopVeg & Farming Friends which costs £4. Click this link to buy a copy of the eBook How to Grow Culinary Herbs.